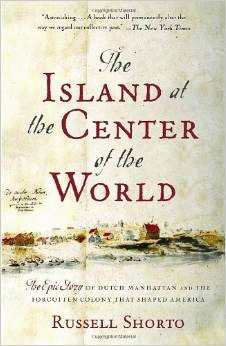 A Book Review: Of Russell Shorto's book, "The island at the center of the World: The Epic story of Dutch Manhattan and the forgotten colony that shaped America." This story is an example of what can happen to American history when context is added back into the narrative. Here, Russell Shorto, drawing on the 25 years of toil by researcher Dr. Charles Gehring, tells the story of how the Dutch colony of "New Amsterdam" actually became the renamed English colony of New York (named for James I, the Duke of York, brother of King Charles II). And after which, the context of the Dutch origins of Manhattan and New York City, were "air-brushed" out of history and promptly forgotten. Like all narratives of American history should be, but are not, this revised story of New York is actually two stories rolled into one: the story of the personal lives of key players, embedded within the story of the larger geopolitical context. The second, less important story, is about how a band of ordinary "explorers, entrepreneurs, pirates, prostitutes, and assorted scalawags from different parts of Europe," were not only able to hack out an existence in the backwater wilderness of the island of Manhattan, but also in the process, were able to create a new society -- important vestiges of which still endure -- and which to a large extent, shaped the democratic institutions we now take for granted, and more importantly, those which, we have long mistakenly attributed to our later mostly hypocritical slaveholding English born founding fathers. The first more important story, is about the missing geopolitical context (which, to reiterate, sadly is consistently an element missing in the stories of the other colonies, and in American history more generally) in which, as it turns out, this rough assemblage of pioneers were in fact mere bit players in a wider 17th Century geopolitical drama: a drama about the struggle for empire among Europeans, Indians, and Africans on the continent, a drama that incontrovertibly created the existing structure of the modern world. Unsurprisingly, we learn here that the little collection of loosely welded together city-states, that made up the Netherlands were not only the fulcrum of, but also the architects and the engineers of the modern world. In the first, more important story, the author tells us about a time when the sun was about to set on the Spanish/Portuguese rule of the seas, and England and the Dutch were on the rise. It is an immensely rich geopolitical story about how these Dutchmen, the "true" men of the sea -- Europe's shipbuilders, suppler of sailors, pilots, and traffickers, took the lead in shaping the "New world" -- despite having been summarily cut off from the world's richest center of trade, the port of Lisbon. In 1580, the condominium that then ruled the sea, Spain and Portugal "blackballed" the Netherlands from major ports. The Dutch answer to this strategically imposed trade embargo -- was to sail completely around the globe (it took a year) with a fleet of gunpowder-laden ships, where they laid-waste to and took over the Portuguese colonies of Java, Sumatra and Malaysia, taking back to Amsterdam some 600, 000 pounds of the world's most valuable spices. As Queen Elizabeth I came to power, England, in the mean time, hadn't yet dug itself out of the Dark Ages. With its economy in shambles, based as it was solely on the sale of wool, the not yet so great Britain had no interest in exploration except our of a desperate need to free itself from the same Spanish trade embargo, and more generally from forever living in Spain's shadow. However, with its spectacular victory over the Spanish armada in 1588, the latter would change. But it would take time and extra effort, and the help of Henry Hudson and his scientist friends, before the former would change, and England would get around the Spanish embargo and into the exploration game with all four feet. The author also tells us that the Dutch came to America purely on a private business excursion, an adventure sponsored by the Dutch West Indies Company. The company's business, pure and simple, was to make money from the lucrative fur trade, not to colonize the continent. They were so wildly successful at it in fact that they became a target of all their envious intra-continental rivals -- especially England. As a result of this success, the Dutch were constantly harried by the Indians from the West; a Swedish colony from the South, by trying to wrest its freedom from Spain, and eventually by being forced to fight three wars with England before finally having to give up their stake in Manhattan in 1664. But the Dutch did not leave the scene before it had left and indelible imprint on America and the "New World." Each of the Dutch struggles at the geopolitical level got played out on the ground among the personalities in terms of the meaning and value of individual liberty each nation would attach to them. The people at the center of them, to this day still make up part of the indispensable context to American history. It was their personal struggles that helped ensure that New York City under the English would develop into a unique place fostering a melting pot of cultures involving the introduction of African slavery to the continent, embodying for the first time the principles of freedom and democracy (that we had always attributed only to John Locke), and ensuring that a wildly fertile intellectual, artistic, and business environment would become the hallmark of New York City for the rest of its existence. Thus, the two stories, the first being the larger contextual story of geopolitics; and the second, a much smaller set of personal stories, primarily of the struggle between two Dutch men and one Englishmen, merged at the geopolitical level as the climatic competition among them got resolved. The three personalities were: (1) Peter Stuyvensant, a complex pegged-legged cantankerous tyrant, neo-racist and anti-Semite, who despite his narrow views, was nevertheless extremely sensitive to Dutch cruelties towards Indians. And (2) Adriaen van der Donck, a savvy Dutch-trained lawyer, whose specialty in today's terminology would have to be characterized as America's first Civil Rights lawyer. For he went to bat for "citizens rights" at a time when the term "citizen" was used very loosely, and the term "Civil Rights" had not yet been invented. Finally, the third is Henry Hudson who fearless exploration both to Russia and to the North American coast, played a seminal role in raising England from the slumber of the Dark Ages, and getting it into the exploration game. Much too often American historical narratives are willfully reduced to little more than self-serving patriotically satisfying myth-based melodramas about the personalities and the personal lives of a handful of rich hypocritical slaveholding Englishmen. In the process, these artfully edited stories, serve to "air-brush-out" the most important part of American history: the complexity of the geopolitical and moral context in which events and the interactions between personalities get played out.